Dominant in both New York & Ontario! Muscle Mass retired to stud duty as the fastest two-year-old son of super-sire Muscles Yankee, having established his world-record mark of 1:53.4 in only his second career start. He won five major stakes in an undefeated season at 2 winning all seven of his starts, including back-to-back wins in Lexington and a 10-length, track and stakes record in the American-National. 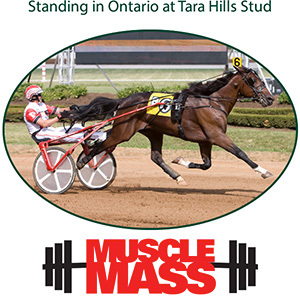 Muscle Mass has established himself as a leading trotting sire in Ontario. Muscle Mass was the leading first crop sire of Ontario Sire Stakes winners in 2012 and followed it up with spectacular years in 2013 and 2014 as the leading Ontario sire of two-year-old trotters in overall earnings, also being the overall leading trotting sire in 2014. He is the sire of multiple Ontario Sire Stakes Gold Champions including RIVETING ROSIE 4,1:52.4 ($903,520), MUSCLE MATTERS 4,1:53.1 ($481,535), MOTOWN MUSCLE 3,1:53.4 ($447,945), MUSCLE BABY DOLL 3,1:52.0 ($471,470) and ON A SUNNY DAY 3,1:53.3 ($431,387). His first New York-eligible crop hit the track in 2017 and dominated the NYSS program. The Muscle Mass 2YOs out-earned their nearest competitor (Chapter Seven) by over $650,000 - lead by Matron and Goldsmith Maid Elim and Final winner PLUNGE BLUE CHIP 2,1:53.1 ($404,690) and Kindergarten Classic Final winner TITO 2,1:55.0 ($239,963).